I had left the room for a few minutes when my mother died. She was terribly ill for 18 months, and we'd all rushed to her bedside many times over those tumultuous weeks. Finally, worn out from the months of battling illness, she told us that the time had come. "This is too hard," she said. "I want to go home." She was 58 years old. At the end, my father kept a vigil at her bedside, supported my two sisters and me. On Mama's last night, my sisters went away from the hospital for a much-needed break. My father never left the chair at the side of her bed. I asked if he wanted something to eat, then hurried to the hospital cafeteria to fetch some food that I could bring back on a tray. When I got back to her room, my father's chair was empty. He had left her bedside. I could hear the shower running in the attached bathroom. And I knew. One look at the bed confirmed my fears. My mother was gone. I'd left the room for 15 minutes, and in that time her eyes had fluttered open one last time, then closed for good. After he finished his shower, my father came back into the room where I sat, horribly alone. He touched my mother one last time and said, "Well, we gave it a good fight, didn't we?" I'd read stories over the years of how families joined together to make a beautiful occasion of the passing of a soul from this life to the next. I guess I imagined that my sisters and I would be sitting at my mother's feet, collecting last bits of wisdom and sending my mom off with words of thanks and hymns of praise. Somehow I always thought that this would be a special, sacred time, when we would all feel the presence of the Lord and weep together. As it turned out, my mom slipped away while I was out getting sandwiches. It was not what I had imagined. Most of all, in my imagination, the occasion of my mother's death was a time that was far, far in the future. It was long, long after my mother had helped me pick paint colors and choose wallpaper patterns and sew curtains and all those little things that we used to do together. It was a time after my children had grown up, long after they'd taken swimming lessons and built pinewood derby cars and sung in concerts and learned to drive and graduated and gotten married. It was after they'd proudly presented my mother with great-grandchildren to love and spoil. It was always later. But as it turned out, my children were 2, 6, and 8 years old when my mother died. 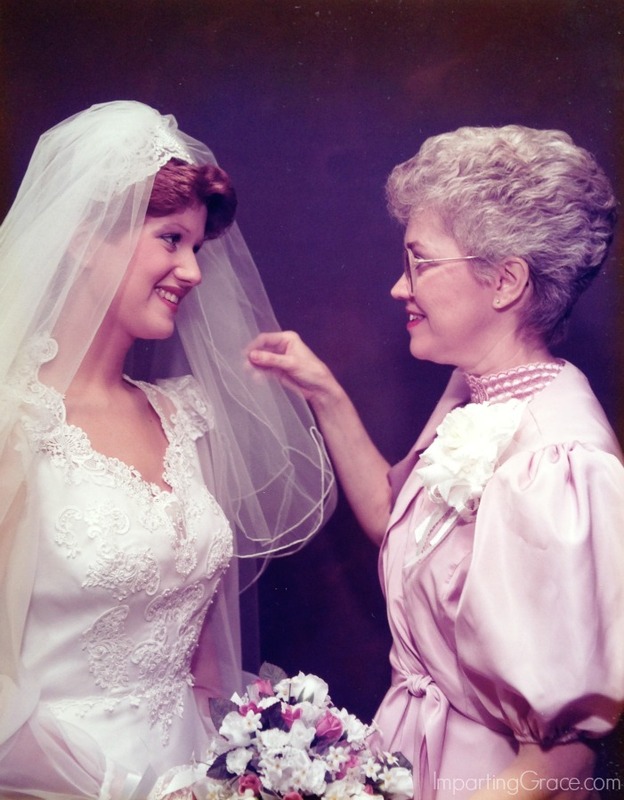 It's been 15 years since I got to wish my mother a happy Mother's Day. Now Mother's Day reminds me that things don't always work out as we'd planned. My mother wasn't perfect, but she was beautiful. She was kind. She did her best to love us and care for us. I wish I could have learned more from her. I wish I could have asked her more questions. I wish I could have struggled through the years of bringing up my own children with her to love and support me. Most of all, I wish I could just tell her thank you again. Click here for a printable version of this poem (author unknown). If you have a mother, thank God and thank her. If you have children of your own, thank God for the privilege. I was so touched reading this, Richella. Thank you for sharing your heart. I wish things could have been different and your mom could still be with you. But all the wonderful things she has put within you are still touching your boys today. I have tears in my eyes. May God continue to comfort you in your loss. Richella, what a beautiful post. I am so sorry that you lost your mom at such an early age. Things like that just are never expected but happen just the same, according to God's timing. I was so very blessed to have my mom for so many years, she was nearly 98 when she died, yet I never knew my grandmothers...they both were gone long before I came along. I love the wedding picture...what a treasure for you to have such a blessed remembrance of her on your special day. Thank you for sharing your heart, friend! This is such a beautiful tribute. My own Mom died when I was in my 20's. She never knew her grandchildren, but I always felt that when she left this earth, she put her order in, as my hubby and I had been married for a few years. I agree, if someone still has their Mom, be sure to let them know they are loved. Sometimes it's hard to say these things, when you are in the middle of life. My MIL lived to be 91 and she was such a blessing to her children, grandchildren and great-grandchildren. We do not know how many days we have on this earth, but I know who holds the future. Have a blessed Mother's Day. A beautiful post, friend. The Lord works in mysterious ways, but I'm thankful for the lessons you learned and how they have in turn, blessed us. Love you. What a beautiful picture of you and your Mom. I know the loss you feel. Happy Mother's day Richella, you are a wonderful Mom and friend!! 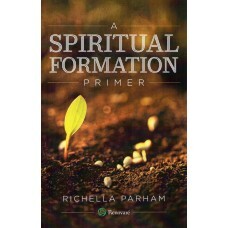 Richella, I can so relate to your story. My Mom had been near death for days. We had sat by her bedside hour after hour. It was a Sunday morning and I dressed so that I might steal away for church if I thought I could but I didn't go. After church my husband came and I decided to run home and change clothes to get ready for the night-watch. I had no sooner left, never made it home and my husband called me. Mother was gone! I felt so bad not being with her but know God had her hand as he ushered her to her heavenly home. That has been 8 years ago and I still miss her everyday! I know your Mother would be very proud of the lovely woman/Mom that you are Richella! Happy Mother's Day! I feel so touched by what I just read. Sometimes, there are no words. This is so beautiful, Rachella. Hugs to you, sweet friend. I'd like to think your mother chose her own time, when you and your sisters were away, so as to further protect and spare you -- a last and final mothering act of greatness. Thank you for sharing your story. What a beautiful mother. What a lovely tribute to your dear mother. So sorry for your loss--especially this time of year. Just a beautiful post. Richella, This is a beautiful tribute to your mother. 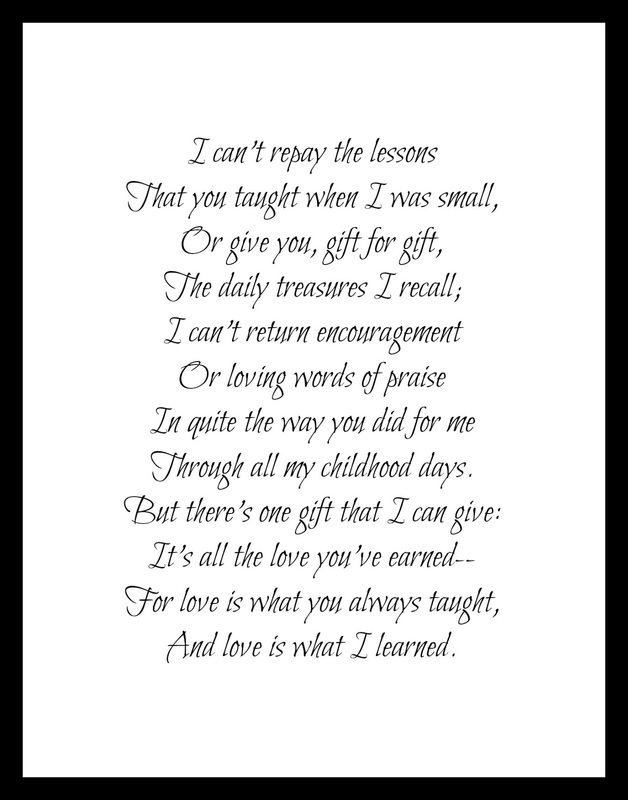 I lost my mom over 15 years ago and Mothers Day is a difficult day. What a sweet post, Richella. Wow, she passed young. She was my age. I hope you have a wonderful Mother's Day. This was so very sweet and precious! I'm in the midst of this with my Mom -- I've already been at her bedside and back again and she continues to hang on . . . Very heart-wrenching. Your post touched my heart! Requested to be your friend on FB . . . I too had hoped for things to be different when my mom died. She had been in intensive care and had been in a regular room at the hospital for a week and she decided that she didn't want more treatment, so it was arranged for her to go to a nursing home. It was January...and there was an big impending storm...so I decided that after I got her settled and she was okay we'd drive back to Buffalo and after the storm return. My husband had taken time from work to go with me and we needed to re-organize so I could return again to stay until "the time." (Hospice workers told us it would be several weeks to several months.) Just a few days later I felt tremendously ill and I was overcome with the knowledge that something wasn't right and I had to get to my mom immediately. I prayed and asked God if one of my friends could be available to make the trip with me...we had mutual friends back in Michigan so it would be a pleasure trip for her. The trip was quickly arranged and she did most of the driving until we decided to get a room as it was midnight. In the morning we left and early she dropped me off at the nursing home door. I immediately walked to my mom's room, I looked in and saw she wasn't in her bed. All her stuff was there. I thought, oh my! She's doing better and they took her to breakfast. An orderly/nurse? met me in the hall and asked what I needed and I asked where my mom was? He said...didn't you get the message? She died around midnight. I didn't have a cell phone, my friend did, but she had hers on the charger all night so we didn't get the call and somehow missed the message. It was such a good thing my friend had ignored me and came in just minutes later. My father died 10 years prior and he also passed in the wee hours of the morning following a good night. I was phoned at 4 AM....in the middle of another snowstorm...but this time I only lived about 40 minutes from the hospital. They had called the doctor first and he was with my dad when he passed...the doctor was a believer fortunately. However, I wasn't called until after????? I did get to see my dad and spend time with him after the fact which was helpful. My mom's body had already been picked up and because she had chosen cremation, I never saw her again. Neither of these goodbyes were as I'd hoped. Isn't it good that the God of all comfort sees us through these times with his arms of love and grace? 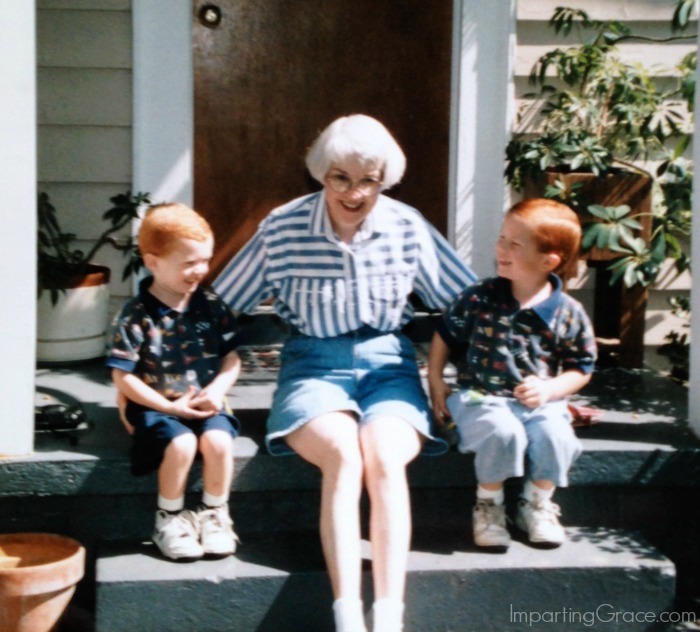 I grew up with my grandmother - and when she died, I was 4 hours away, raising a house full of boys without family nearby - and nobody was sure about "when" - and I missed being there. I've regretted it every day - that I wasn't there at her bedside, holding her hand - and I miss her everyday still! God knows why you went to get that sandwich - God wasn't surprised. Wishing you a warm, heart-felt mother's day as you wrap your arms around your children - and vintage the beautiful things she put in you! I think you just did share all those wonderful things with her. It sounds like you were blessed with a loving mother-daughter relationship. This post brings me to tears, Richella. For so many reasons. First, because I'm so sorry you had to lose your mother at such a young age. I can't imagine. Second, because I'm feeling the fleeting-ness of life as a mother right now. But mostly because my mother is here in my home right now. Over the past few years, our relationship hasn't been what I'd want it to be. My mom has become cynical and snarky in her older age, and it's hard to deal with. I've lost patience with her too many times to count. It's just a difficult relationship. But she's here for my daughter's college graduation--on Mother's Day--and I want to honor her. Thank you for this reminder that my mom is a gift. Hi Richella - This is a beautiful post. We really can't know how things will turn out can we? My mom's death wasn't as it SHOULD have been either . . . at least in my way of thinking! Plenty of thoughts of mom this Mother's Day weekend. Richella, I am sorry that you lost your mom at such a young age, yourself in the early throws of mothering. Death is such an enemy and thief. You are such a lovely woman, I can only imagine how proud your mom would be to enjoy you at this stage of life. I miss my mom every day. Thank you for sharing. Very moving.